A memorial and a symbol of defiance. Updated 3.40pm - Government workers on Wednesday sealed off Great Siege Square in Valletta, ostensibly for further restoration works, but effectively adding another barrier to activists who have been using the foot of the Great Siege Monument as a memorial to Daphne Caruana Galizia. 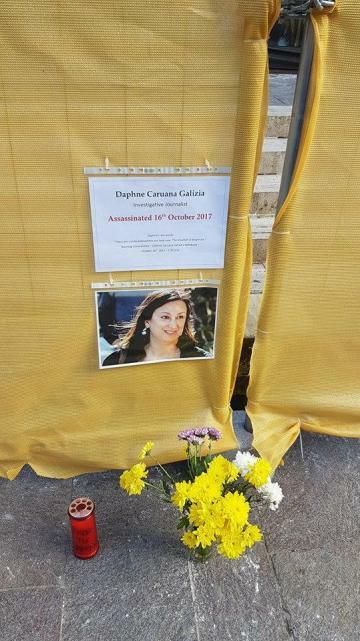 But within hours of the new hoarding being put up, the pressure group Occupy Justice pinned a new picture of the murdered journalist to it, along with flowers and a candle. The activists have repeatedly complained that the government is denying them the right of expression when it repeatedly sends its workers to clear up the memorial. An application was also filed in court and the case is pending. The Great Siege monument was sealed off immediately after the Great Siege commemoration on September 8. Justice and Culture Minister Owen Bonnici had claimed the monument was being restored, although no works were actually evident for many weeks. Activists had then unfurled a banner of Ms Caruana Galizia across the hoarding but this was again removed. Photos and flowers, however, kept being placed in front of the hoarding and the government has now set up an iron fence covered in yellow fabric around the entire square. This is just how much @JosephMuscat_JM is uncomfortable with #truth and #justice on the assassination of #DaphneCaruanaGalizia. 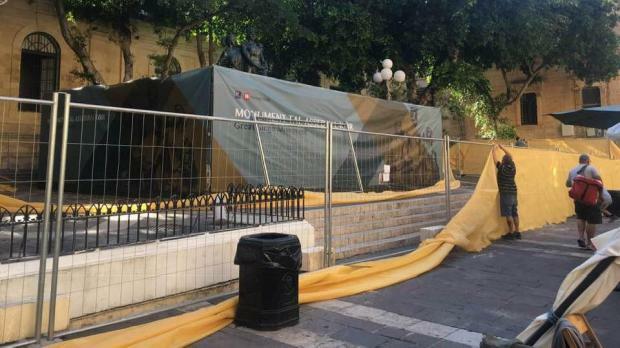 Replying to a parliamentary question, Dr Bonnici had said there would be a second phase to the cleaning of the monument which would involve further restoration such as the improvement of the lighting system and the pavement surrounding the monument.